We usher in 2012 with a look at one of Salt Lake City’s newer restaurants, one that arrived on the scene with a lot of fanfare: Zy. Or, more formally: Zy Food Wine & Cheese (that’s the full name of the restaurant). Located on State Street just south of the City Center Marriott, Zy features high ceilings and a wall of windows, which, combined with myriad other hard surfaces, means this is one of the noisier dining destinations you’ll find. If you like the buzz and bustle of strangers’ conversations bouncing around the dining room, you’ll like Zy. However, if you’re looking for an intimate spot to enjoy a quiet meal, this isn’t it. I can’t say that I’m very fond of the sparse, cold, minimalist décor at Zy, but I have met folks who like it. There is a small bar en route to the restrooms, which seems to serve no real purpose. I doubt you’d want to sit there staring at the blank wall behind the bar, although you could peruse the cheese in the display case there, I suppose. It doesn’t look very inviting, however: The cheeses (a specialty of Zy) are tightly bound up in layers and layers of plastic wrap and look like they could survive the Rapture intact. It’s just one of many oddities here. I’m fond of Miles Broadhead, the well-seasoned general manager at Zy. And the chef, Matthew Lake, has an impressive résumé, which includes being named as one of Food & Wine magazine’s “Best New Chefs in America” a number of years ago. So it’s hard to understand why, for example, as I waited for my lunch companion to arrive during one visit, my server asked, “Can I get you anything while you wait? Do you want some cheese?” That’s one of the weirder questions I’ve ever been asked. Why, of course! I start every meal with cheese. Strange. During a recent dinner, my dining partner looked at her plate and mine and said, simply, “I’m confused.” Unfortunately, that pretty much sums up the cuisine at Zy. It’s confusing. For example, in the dead of winter, a seafood appetizer was seared scallops ($12) on a summery bed of green pesto that had been zapped with so much lemon I couldn’t taste the mollusks. On the other hand, a plate of chorizo meatballs ($7) was delicious: meatballs bathed in a rich, sherry-cream sauce. It’s just that, well, the meatballs didn’t taste at all like chorizo. What confused my dinner companion the most was the Steelhead trout entree ($23) she ordered. It came buried (we literally could not see the trout) under a mélange of roasted onions, porcini mushrooms and apple wedges, topped with pumpkin seeds. If there had been roasted pork or sausage under that wintry roasted-root and mushroom concoction, it might have made sense, but Steelhead trout just doesn’t pair very well with roasted apples and onions. Simpler menu items—such as fried potatoes with herbs and sea salt ($4)—are a better gamble. In fact, the fried potatoes are great: thin spud slivers flash-fried to a perfect crispness and lightly tossed with herbs and salt. Likewise, a simple skirt steak ($16) rubbed with pepper and served with a Romesco sauce is quite pleasing. Crab fritters with a lemon and herb tartar sauce ($8) were sound, if not particularly memorable. I like the wine list at Zy. It’s eclectic, and most wines are available both by the glass and by the bottle. There are just a handful of wines, ranging from $75 to $150, that are only available by the bottle. However, the wine is served in stemless glassware, which doesn’t really seem appropriate in a fine-dining establishment. I frequently use stemless wine glasses at home—they fare better in dishwashers than glasses with stems—but I tend to expect something a little classier when I’m paying $28 for an entree. That’s what my lamb loin cost, and it was a final disappointment. I took two bites of the basil-crusted lamb, with roasted root veggies strewn around the plate, and called it a night. The combination of lamb and basil with root vegetables and goat-cheese polenta might sound interesting on paper, but on the palate it’s just a conglomeration of mismatched flavors. In a word: confusing. 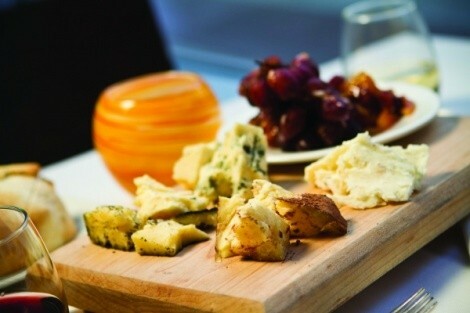 Should you linger past your entrees at Zy, skip the forgettable desserts and opt instead for a cheese plate. They’re not inexpensive, priced at $11 for a choice of three small pieces of cheese or $15 for five. Selections range from local—Beehive’s Barely Buzzed and Promontory Cheddar—to imported cheeses like L’Edel de Claron from France and Italy’s Boschetto Tartufo. At least there is nothing confusing about the cheese.